Do you have old babbitt bearings that need to be replaced? Babbitt is a special type of metal that was designed for use as bearings due to its heat resistance and durability. The metal is normally comprised of varying percentages of copper, antimony, lead, arsenic and tin. The exact percentages vary, according to the grade. For example, our ASTM B-23 Grade 13 Babbitt, which is recommended for low-speed applications, is comprised of 6 percent tin, 10 percent antimony and lead, while our ASTM B-23 Grade 3 babbitt for lead load applications is comprised of 84 percent tin, 8 percent lead and 8 percent copper. Of course, once you have the right type of babbitt metal, you’ll need to pour your babbitt bearings. In order to remove your old bearing, you will have to open the existing bearing case and melt the bearing free with a torch, preferably an oxy-fuel welding and cutting torch. Don’t forget to melt the surrounding components, including the holes in the bearing shell holes and any grooves. This will help ensure that you have a clean surface to work with. Next, you’ll have to scrub the inside of the bearing case. This is because bearing cases often get inundated with oil, and you will need to remove all that oil in order to ensure the success of your new bearing. You can clean the bearing case with a caustic solvent, sandblaster or grinding wheel. If you choose to use a solvent, remember to thoroughly rinse all the solvent from the case. Once you’ve cleaned the case, it’s a good idea to test the cleanliness with heat, especially if the case and bearing are particularly old and well-used. If you see any additional oil seeping out of the metal, you’ll need to clean it again, and you may want to repeat this process several times. Since you’ve removed all the worn-in oil and grease, which you have to do, you’ll need to recoat the bearing shaft in order to prevent your new babbitt bearing from sticking to it. There are couple ways you can accomplish this. You can use a candle to coat the shaft with smoke or you can rub the shaft with tin or solder. If you choose to use tin or solder, you will need to quickly rub it with a wire brush to help bond the tin or solder to the bearing shaft. Next, put the bearing shell and shaft back together. This is best accomplished by setting the shell vertically and inserting the shaft into the direct center of the shell. Once you have the shell and shaft put back together, fill the bearing holes with caulk or another material, like sheet metal or clay. Just remember to make sure the material you use to plug the holes is heat and fire resistant. You are now ready to melt down your new babbitt metal. You’ll want to use an electric lead pot or another type of pot that is specifically designed for melting metal. While your babbitt melts, don’t forget to stir it to maintain a uniform temperature. Since you’ll have to make sure your babbitt has reached the desired temperature, it’s important to test it with a thermometer. We typically recommend using a thermometer that’s designed for casting bullets. Since your bearing metal is hot, it’s important to heat your bearing shell and the shaft prior to pouring in order to reduce the risk of thermal shock and damage to your bearing shell and shaft. However, if you’ve already heated the bearing shell during cleaning, you won’t need to heat it again. Babbitt metal can contain impurities. These can be seen on the surface of the metal after it’s been completed heated to the desired temperature. Skim these impurities from the metal using your stirring ladle. Now, it’s time to pour your bearing. You’ll want to use a large ladle that can accommodate the entire amount of new bearing metal. If you do not have a single ladle that is large enough, you can use two ladles, but you will have to pour both ladles into the bearing casing at the same time to prevent any boundary layers from being formed. 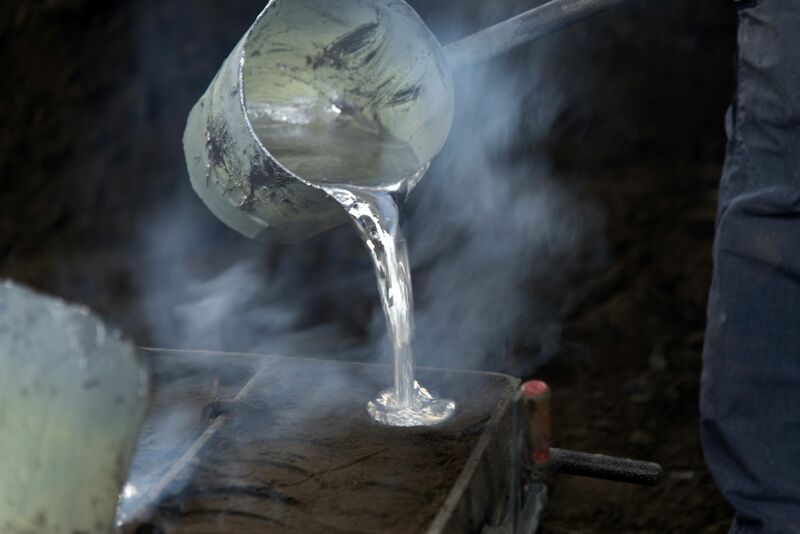 No matter which way you pour the metal, you will have to take care to ensure you pour the metal evenly and slowly. Once you’ve poured your bearing metal into the shaft, leave it stand long enough to completely cool and harden. Once the new bearing is cool, it’s time to drill out the oil holes that you moved in step 4 to prevent the liquid babbitt metal from seeping out of the holes. In some instances, you may want to test your new bearing with the aid of a small motor and a belt. For this test, you’d oil or grease the bearing and put the bearing in the belt and turn on the motor. As the belt moves, the bearing will move, allowing you to make sure it can withstand the heat levels and operational noise. If you need new babbitt bearings, you may find them difficult to source. This is because babbitt bearings are no longer commercially manufactured. Fortunately, you can acquire your own babbitt metal to handcraft your new bearings. Here at Belmont Metals, we can the babbitt metal you need to pour your own babbitt bearings in a variety of grades, including Grades 1 through 15. This means that you can source babbitt metal that is perfect for low-speed and high-speed applications as well as heavy lead applications. To learn more about our babbitt metals, call us at 718-342-4900 or feel free to place your order online.